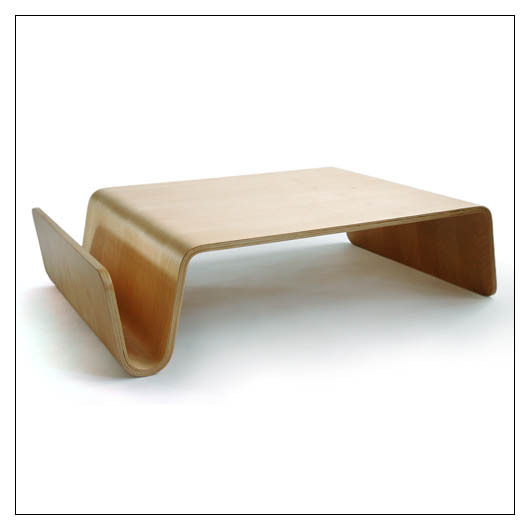 ON SALE ITEMS ( SCANDO ) ::: Furniture for the Home, Office, Home Office, and More at Pure Design Online! Designer Eric Pfeiffer has created an heirloom quality table accommodating the wants and needs of both the young and young at heart. For the very young it's a low, soft, and inviting form that provides an aid to help in the process of standing up and negotiating furniture for the first time. The low casual stature of the table gives older kids an inviting space to gather around. For adults this rational form is an elegant and sensuous table that provides an effortless solution for smaller living spaces. In addition, the useful storage pouch creates a convenient place to keep those magazines and books close at hand. One or more versions of this product are available at a significantly discounted price on the Pure Design Basement site, including finishes not otherwise available at this time. Note that items from the Basement generally have cosmetic flaws of some sort, and are not returnable. See the Basement for complete details.